7 Day Uganda Birding Safari & chimpanzee Holiday. Day 1: Kampala – Murchison Falls. After Breakfast, you will be picked up from your place of accommodation by your driver/guide and head to Murchison falls park, passing through traditional homesteads of Luwero triangle. You will have Lunch enroute, at Masindi and proceed on to enter the park through Kichombanyobo gate. Here you do a mini game drive towards the top of Murchison falls. This is the most impressive falls in the region. Some of the species we expect to see here include; the Red-winged Pitilia, white-crested Turaco, Pel’s fishing owl, Rock Pratincole, Bat Hawk and a variety of wildlife. We later proceed and check in to the service of Fort Murchison dinner and Overnight. Day 2: Bird watching in Murchison falls – Launch cruise. After breakfast, with your packed lunch, you will start the game drive/Birding in the northern sector of the park. And some of the specialties we expect to encounter here include the Foxy Cisticola, Red-necked Falcon, Black-billed Barbet, Swallow-tailed, Northern Camine and Red-throated Bee-eater, Pel’s Fishing Owl, Woodchat Shrike, Bueatiful Sunbird, Red-winged Grey Warbler, African Quail-finch, Black-bellied and Denham’s Bustard, Harlequin Quail, Common Button-quail, abyssinian Ground-hornbill, White-tailed Lark and the rare Shoebill stork among others. We also expect to see a variety of mammals including the Buffaloes, Jackson’s Hartbeast, Giraffes, Oribis, Elephants and many more. You go back to the lodge, have lunch, relax around and latter in the afternoon you will go for a Launch cruise to the bottom of the falls. You are likely to see many aquatic bird species on the shores of River Nile, schools of Hippos, crocodiles and the spectacular Murchison falls at close range. We come back to the lodge for dinner and overnight. 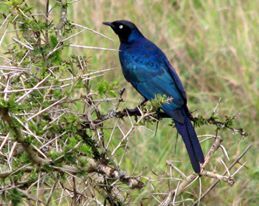 Day 3: Full day birding Budongo forest & Kaniyo Pabidi. After Breakfast, with our packed lunch, we transfer to Budongo Forest, for a full day in the forest birding at Kaniyo Pabidi. Here we expect to see birds like: Yellow and Grey Longbills, Forest Francolin, Rofous Crowned Eremomela, Ituri Batis, Yellow Spotted Barbet, and Red tailed Ant-thrush, Dusky Long-tailed Cuckoo, African Pied Hornbill, Brown-backed Scrub-robin. Black Bishop, Brown Twinspot, Black-Bellied Fire Finch, Chocolate-Backed, African Dwarf and African Pygmy Kingfisher, White-thighed Hornbill, Yello-spotted, Fairy-breasted and Yellow-billed Barbet, Spotted Greenbul, Cameroon Sombre Green Bull, Slender-billed Green Bull, Rufous-crowned Eremomela, Chestnut-capped Flycatcher, Jameson’s Wattle-eye, Lemon-Bellied Crombec, Fire Crested Alethe, Crowned Eagle, and Puvel’s Illadopsis among others. Dinner and Overnight at Budongo Eco Lodge. After Breakfast, you will transfer to Kibale national park with lunch enroute and stopovers at some birding spots along the road. We arrive Kibale in the afternoon and check in to the service of Primate Lodge Kibale for dinner and overnight. After Breakfast , go for Chimpanzee Tracking in the forest -. After seeing the apes, you begin on the Forest Walk and You will see: White-spotted Flufftail, White-napped and Afep Pigeon, Green-breasted and African Pitta, Abyssinian Ground-thrus, Grey-throated Flycatcher, White-bellied Crested Flycatcher, Scaly and Nahan’s Francolin, Green-backed Twinspot, Black and White Mabnikin, Narina Trogon, Olive Long-tailed Cuckoo, Black Bee-eater, Blue-breasted and Shining-blue Kingfisher among others. You come back to the lodge for Lunch and later in the afternoon you will go for More Birding at Bigodi Wetland Sanctuary: Some of the specialties we expect to see here include the Great-blue Turaco, White-spotted Flufftail, Blue Headed Coucal, Purple-headed Starling, Cabanis’s and Joyful Greenbul, Wilcocks and Lesser Honeyguide among others. You go back to the lodge for dinner and Overnight. Breakfast at leisure and then transfer to queen Elizabeth park, driving along the foothills Mountain Rwenzori and you will enter with a mini game drive and later check in to the service of Kasenyi Safari Lodge, have lunch and in the Afternoon you will go for a Launch Cruise along kazinga channel. Here you are likely to see many aquatic birds species, schools of hippos, crocodiles, elephants and Buffalos among others. Dinner and overnight at Bush lodge. After breakfast, we check out of the and go for the game drive towards the Kasenyi plains in search for wildlife/birdlife that includes Green-winged Pytilia, Collared Pratincole, Terminicks Couser, Pallid and Montagu’s Harrier among others. We start driving back to Kampala with enroute lunch at Igongo Cultural Center, Mbarara. We later proceed on, reaching Kampala in the evening and drive straight to the Airport for your flight back home.